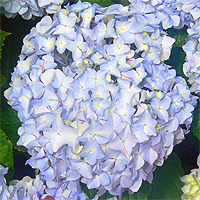 Of the 20 to 30 species of Hydrangea, the Big Island seems to be composed mostly of Hydrangea macrophylla. 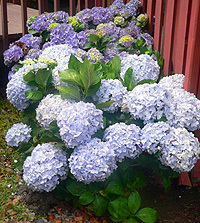 This very popular variety came to Hawai'i from China and is known around the world by a wide variety of names including: Big leaf, Blue Wave, Nikko Blue, Blue Billows, Mopheads, House Hydrangea, French Hydrangea, Japanese Hydrangea, Ajisai, Hortensia, and Mil Flores. The flowers themselves grow in a tight ball like cluster and range from a white inside to beautiful pastel to deep blues and purples on the fringes. At full bloom the entire plant is covered in the colorful pom-poms making a hedge of this ornamental very beautiful and inspiring. 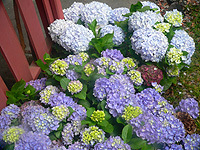 While the primary blooming season for Hydrangea are July through August, you can often find the plants in bloom during other times of the year, though not producing as many flowers. 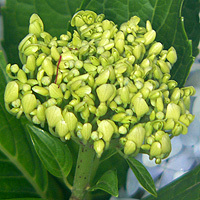 As we have noted, the color of the flower varies from a blue to a purple. Which color occurs is due to the acidity of the soil. Plants growing in acidic soil will have bluer flowers: the more alkaline the soil, a more purple the flower. 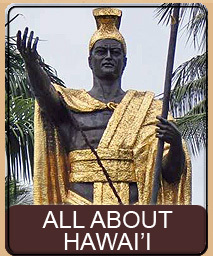 In most other parts of the world the plant does not go much above 5 feet tall, but in Hawai'i the Hydrangea seems particularly happy and can create hedges up to 8 feet tall. Also, unlike the rest of the world, Hawai'i soil seems to have exactly what the Hydrangea like. 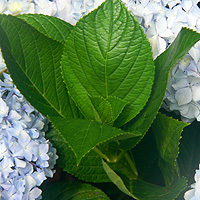 Normally to make a blue Hydrangea you must have soil with a pH of 5.5 or less and aluminum must be present in the soil. Growers will add aluminum sulfate to the soil in order to create this condition. 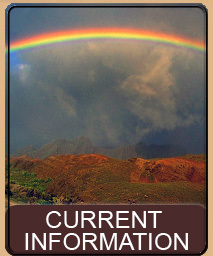 However, I guarantee you that people are not doing anything to their Hydrangeas here in Hawai'i (we certainly don't, and all the photos on this page are from our Hydrangeas) - and I don't think aluminum is present in the natural lava rock and ash that seems to be their happy growing medium. In fact, you very often see plants on one side of a driveway being a bright blue, while the plants just a few feet away on the other side of the driveway will be a bright purple. I have even seen situations where a cluster of Hydrangea exhibit blues to purples right in the same area. 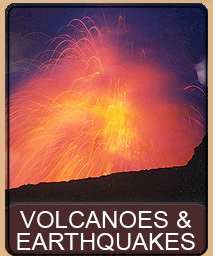 This is especially pronounced in Volcano Village - and most likely the reason for this is the highly acidic rain from the volcanic vent. 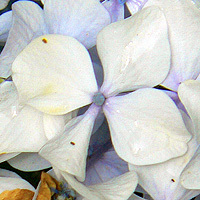 The Hydrangea is a water loving plant and requires much water to survive. 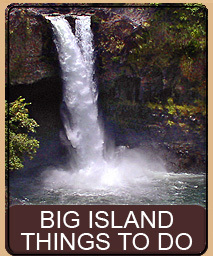 For this reason they tend to be the most popular on the rainier Big Island and especially on the Hilo side, from the Waimea to Volcano. Near the ocean the plants only grow a few feet high, but at higher altitude they reach a more mature height. Regardless, all the plants produce the same beautiful snow-ball blooms. 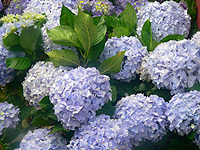 It is important to note that all parts of the Hydrangea are toxic, including the flowers, and contain Hydrangin which is a cyanogenic glycoside. 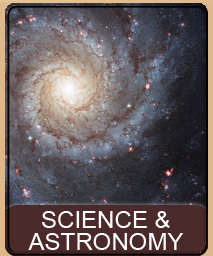 To humans it is toxic only if large quantities are ingested and produces symptoms including nausea, sweating, and vomiting. A small hedge in full bloom. in just a few feet. 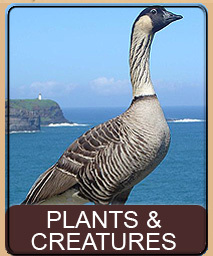 This page is named 'Plants.hyd'. Can't Find It?